Kids can count the birds in the backyard! The Great Backyard Bird Count is to be held from February 15-18, 2019. Anyone anywhere in the world can count birds for at least 15 minutes on one or more days of the count and enter their sightings at www.BirdCount.org. This would be a great classroom or family activity! Here’s How to Participate. New York, NY, Ithaca, NY, and Port Rowan, ON —The 22nd Great Backyard Bird Count (GBBC) will take place from Friday, February 15 through Monday, February 18. Volunteers from around the world are invited to count the birds they see for at least 15 minutes on one or more days of the count, then enter their checklists at birdcount.org. Anyone with internet access can participate, no matter what their skill level—it’s a great family activity, too. 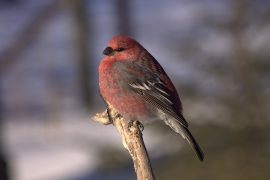 Pine Grosbeak male by Candace Trost, GBBC participant, Manitoba, Canada. 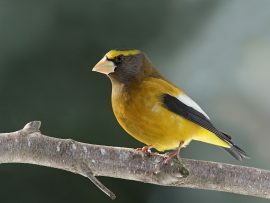 “With the finch irruption this year, we’re hoping for record bird numbers and another record-breaking year for Canadian participation,” says Jon McCracken, Bird Studies Canada’s National Program Director. “In search of a bit of relief from our cold winters, many Canadians become ‘snow birds’ at this time of year, and spend a bit of time birding somewhere warm. While I always strongly encourage counts in our own snowy Canadian backyards, don’t forget that you can participate anywhere in the world. Last year, I did my count in Florida’s Corkscrew Swamp, and had a fantastic day.”To learn more about how to take part in the Great Backyard Bird Count, visit birdcount.org. 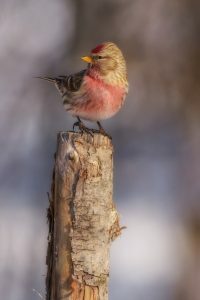 The Great Backyard Bird Count is a joint project of the Cornell Lab of Ornithology and the National Audubon Society with partner Bird Studies Canada and is made possible in part by founding sponsor Wild Birds Unlimited. (1965 Highway 95A) on Saturday, October 17th. There are also others planned elsewhere in the US. These lanterns are 100% biodegradable. Not to mention after each release we have professional “Lantern Chasers” that will make those armored truck driving meteorologists look like your local news’ weatherman. These lantern experts collect 90% of the lanterns after the event. Historically lanterns were used to symbolize good fortune, request favorable weather, or to celebrate the life of a loved one, just to name a few. But here in 2015, we don’t care if you are turning over a new leaf or just snapping some sweet shots for Instagram. Families and friends can dance to the music, roast marshmallows, munch on snacks provided by local vendors, and of course, watch the lanterns float away in an unforgettable release. Each registrant will receive their own lantern as well as some other goodies. Safety and Conservation are very important! More questions are answered here. 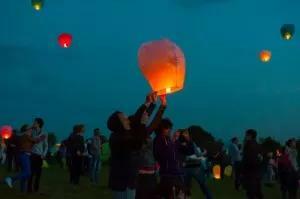 The Lantern Fest organizers partner with a charity for every event. For our Reno event, we are excited to be partnering with The Down Syndrome Network of Northern Nevada (DSNNN). Check out my blogs about things to do with kids on https://mygrandmasue.wordpress.com by the author of the award-winning children’s book Grandpa, Do It! I Do It, Too! World Earth Hour happens this coming Saturday (It is always observed on the last Saturday of March.) wherever you are on Earth at 8:30 p.m. Local Time. Another interesting site explaining Earth Hour and all kinds of family activities is from the group that started it in 2007: World Wildlife Fund. timeanddate.com tells it like this. Check out also earthhour.org . How dark will your city/town/village get? We will see! On Sunday, October 26, 2014, at the Victorian Square in downtown Sparks, Nevada, there will be a Pumpkin Palooza festival from 11 a.m. until 5 p.m. Take the kiddies to play carnival games, show off their Halloween costumes in the costume parade, race pumpkins in the pumpkin derby, compete in the pumpkin pie eating contest or the pumpkin seed spitting contest or the mummy wrapping contest, enjoy the live music and food vendors. There will be a marshmallow shooting range. Storytelling will take place in the ‘haunted’ Glendale Schoolhouse. Get your fortune told. Admission to the festival is free, but you’ll need pocket money for many of the activities. See more details, derby rules, and photos from last year’s festival at the Pumpkin Palooza website. Pumpkin Palooza is a harvest festival that benefits the Northern Nevada Center for Independent Living. Kids can count the birds in the backyard! The Great Backyard Bird Count is to be held February 14–17, 2014. Anyone anywhere in the world can count birds for at least 15 minutes on one or more days of the count and enter their sightings at www.BirdCount.org. This would be a great classroom or family activity! Here is an instructional video all about what you would need to do from the website of the GBBC (Great Backyard Bird Count). Here’s How to Participate. Here’s GBBC for Kids! From Afghanistan to Zimbabwe, bird watchers from more than 100 countries are expected to participate in the 17th annual Great Backyard Bird Count (GBBC), February 14–17, 2014. Anyone anywhere in the world can count birds for at least 15 minutes on one or more days of the count and enter their sightings at http://www.BirdCount.org. The information gathered by tens of thousands of volunteers helps track the health of bird populations at a scale that would not otherwise be possible. The GBBC is a joint project of the Cornell Lab of Ornithology and the National Audubon Society with partner Bird Studies Canada. The Great Backyard Bird Count is a great way for people of all ages and backgrounds to connect with nature and make a difference for birds. It’s free and easy. To learn more about how to join the count visit http://www.birdcount.org and view the winning photos from the 2013 GBBC photo contest. Grandpa Ron and I have a Red-tailed Hawk, Harris Hawk and Northern Harrier that like to visit for dinner. They perch on the wall outside a window. I captured 2 pictures of the Harris Hawk before he had enough of me and flew off. 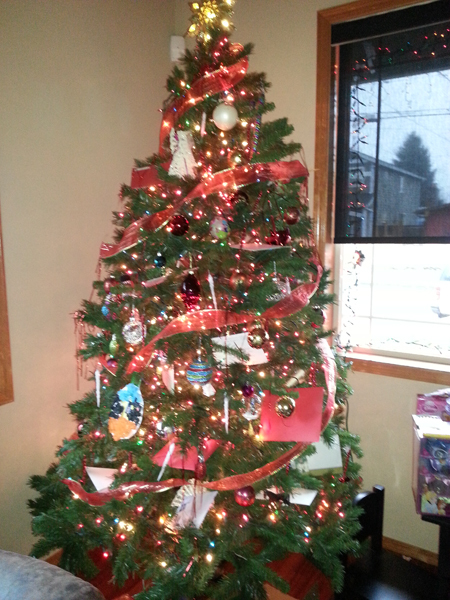 May you all have a super holiday season and a joyous and prosperous new year! Enjoy your family and friends! Check out my other blogs about things to do with kids on https://mygrandmasue.wordpress.com by the author of the award-winning children’s book Grandpa, Do It! I Do It, Too! I’ve shared this through the years now. You are in for a treat if you haven’t done this before — you should check out the the Washington DC fireworks on PBS Television on the Fourth of July! The last three years were just AWESOME!! PBS TV runs the program live and then re-runs it again for those who missed it! It just keeps on getting better and better. The 31st annual broadcast of the Washington DC fireworks will air live in HD on PBS Wednesday, July 4, 2012 at 8 p.m. ET (check local listings). The facebook page is here!